When it rains it pours. Here in my home state you don’t complain about rain very often as we rarely get enough of it. You can go an entire month without rain, then get a months worth of rain in a day….. Proper drainage is generally dealt with when the house is constructed, however changes in the property such as landscaping, pools, concrete surfaces and new structures can create or increase drainage issues. Many times, proper drainage is the cause, but not recognized as the problem. Look at the following items to see if you have any of these problems. If you do, proper drainage may be the culprit. Flooding: This one is pretty obvious, but during heavy rains, water seeks low spots and paths of egress. A good heavy rain of 1-3″ of rain in an hour will identify locations of standing water, pooling and recognizable paths the water may be following to enter the structure. Rotting Building Material: House built prior to 1980 were constructed without any form of treated wood where the framing comes in contact with concrete foundation. Most issue show up in interior/exterior walls, sill plates and framing structures. These sill plate can degrade over time due to excessive moisture. Wood rot can occur in wood with a moisture content of 28% or greater which translates to RH of approximately 100%. Structural Movement: If the sill plate has deteriorated due to water exposure, it can break down and create structural movement that may result in shifts and cracks sheet rock. Foundation Movement: Excessive water under a foundation can cause the piers and beams to move. Extreme movement can cause permanent damage by cracking concrete slabs and beams. Large cracks can even act like a hinge resulting in constant movement. Moisture Content: High moisture content in the soil under the house (crawl spaces and basements) can cause #6, 7, and 8. Pest Control: Water and moisture attracts bugs and insects of all types; the worst of all are termites. By controlling the moisture content in and around the house will positively affect the amount of insect infiltration. The probability of termite infiltration will be high when the moisture content of wood is greater than 20%. 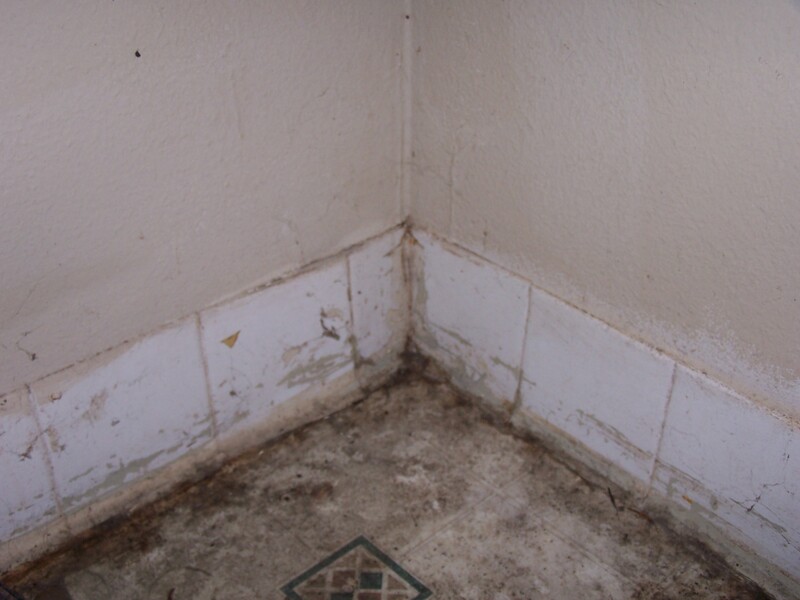 Mold: Much like #5, moisture content will impact this problem. Houses (with crawl spaces and basements) that have a relative humidity of 70% or greater can have a mold problems. Expect to find mold where the moisture content of wood structure to be at 20% or greater. Air Quality: Associated with #5, 6, and 7 will impact this item. Unpleasant, musty or certain health conditions could be due to the presence of mold, animals or animal feces can negatively affect the quality of air in the conditioned space of house envelope. Top Ten List of Construction tasks to encourage proper drainage courtesy of Clemson University. Correcting Drainage Problems: For the water that reaches the structure surface, it will need a natural or man-made method of moving water away from the building. The severity of the problem will determine how much drainage work is required. The best way to deal with it is to address the obvious and monitor the results. If you continue to have the problem, take the next counter-measure to attack the problem. Look at the following solutions to determine which solution best matches your problem. Surface landscape should have at least a 4 degree grade away from the structure: This will encourage water to move away from the house not toward it. This may be accomplished by regrading the surface material or possibly adding surface material to create the grade. Do you best to avoid the 6″ restriction mentioned in #2. Sill plates: Should be approximately 6″ vertically from the exterior surface grade. Besides the obvious, keeping dirt away from the sill plate will reduce the opportunity for bugs and insects to enter the house through cracks, crevices and weep holes. Crawl Space Height: In a perfect world, the height of the crawl space should be above the exterior surface grade. Adding material in the crawl space can be difficult after the house is built. If possible, dome the grade of the material so it is higher in the middle and lower around the edges. If you choose to add this material ensure you retain a 24″ clearance for the crawl space. Note: Dont view this item as a requirement as it may be very difficult to complete without negatively effecting other items. Roof Gutters: Ugly as they may be, they serve a purpose. During a heavy rain fall the surface area of the roof takes on a lot of water. Naturally it will run down the roof to the edge. Without gutters this water and the lack of a proper grade can cause excessive water to pool under the house. Assuming you have the natural grade mentioned in #1, much of the surface water will flow away from the house in a path of least resistance. Hopefully its path takes it to the street, alley or drainage ditch. Additionally, the gutter downspout should extend away from the house at least 10′ with a fall of 6″ over the 10′ distance. This will ensure the water moves away from the structure. 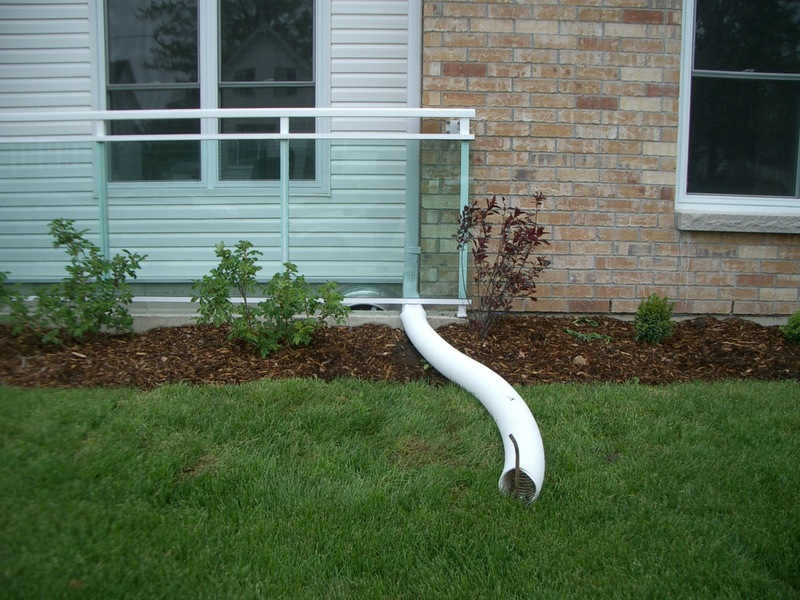 Roof Gutters combined with sub surface drain pipes: To reduce the ugliness of the roof gutter downspout, adding sub-surface drains can help. Granted, this can be expensive as these pipes must be ditched into the ground and run far enough away from the house for the water to naturally drain. Dry Creeks: This may be a stone or rock drainage ditch that is normally dry until the rain water needs a place to go. Creating a Dry Creek to channel the water will assist in moving the water around or away from the residential structure. Read more about how to build a dry creek. French Drains: Similar to sub-surface drains, but the pipes are normally perforated. These 4″ pipes pick up the water that is seeping into the ground; like the sub surface drains, these pipes must be ditched away from the house with a fall and run far enough away to allow the water to drain naturally. 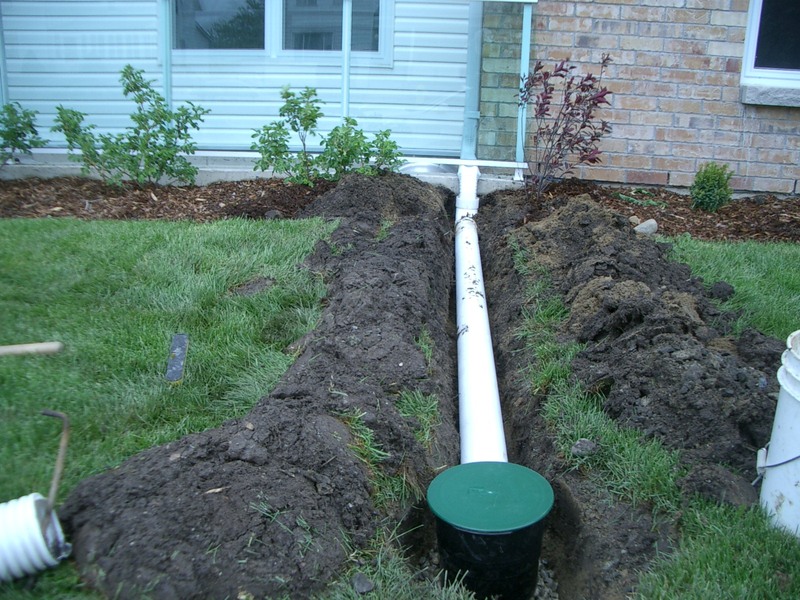 TIP: It is not unusual to have both sub-surface and french drains, but they should not be mixed; in other words do not combine them into just one pipe system. This item is easily a topic in its self. Read more about how to build a french drain for more details. Sump pump: This may be considered drastic, but if you have a serious drainage problem and you find that you continue to have large amounts of water pooling; creating a sump under the house and collecting the water in a pit then pumping it outside the structure and away from the house. Vapor Barrier: More moisture control then drainage, but they go hand in hand. With most crawl spaces, the floor is dirt. This is very normal and in the early days of construction, houses were built to allow the flow of air to pass through the house crawl space. However, as we spend more money and time to insulate and tighten up the house we can create a worse problem in the crawl space. The best way to deal with the dirt floor and the moisture associated with it is to cover it with plastic (aka: moisture barrier). By sealing the dirt floor from the crawl space you will dramatically reduce the moisture content that is transmitted through the dirt. Look for a future article on this topic as I am currently completing this project myself. Dehumidifer: Besides the moisture barrier mentioned, you may also consider using a dehumidifier in the basement or crawl space to further reduce the humidity factor. This is a common solution; some new home builders even require (as part of the home warranty) the homeowner adds a dehumidifier in a basement to keep the warranty intact. Rain Water Collection: This is an alternative method of dealing with drainage issue. In concept, instead of pushing the water away from the house, the water is collected in cisterns, barrels or tanks using the gutters and drains. The water can be treated or used to water the landscape when its dry. Look for future articles on this subject. Proper drainage can be a difficult nut to crack. For me, having the correct exterior grade, crawl space height and sill plate clearance has been a struggle if not impossible and I am still working to find the complete solution that normalizes the condition. Look at all these items as a “system solution” and even though you may not be able to fix everything perfectly, the collective impact of solutions can address the problems associated with poor drainage.